There are only two weeks remaining until the application period opens for the 2019-20 school year. It’s very important that you activate your account before the start of the application period so you will know which programs you are eligible to apply to. Below are some important points to help you understand this information and how it relates to the application process. Once your family activates your account, you will see a list of all the high school programs to which you can apply using GoCPS. Many schools offer multiple program options. In most cases, students will apply to individual programs within a school vs. applying to the school in general. To apply to ninth grade, students will submit only ONE application for the programs they are interested in. Programs are categorized in two groups: Choice Programs and Selective Enrollment Programs. 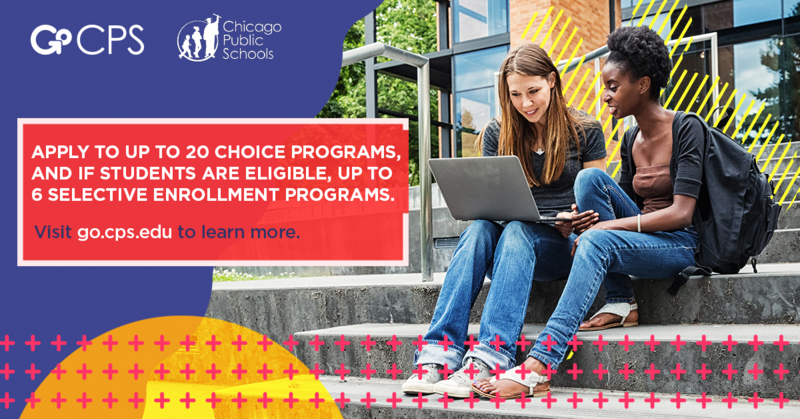 Families can apply to up to 20 Choice Programs, and if students are eligible, up to 6 Selective Enrollment Programs. During the application period, you will select the programs you want to apply to, rank them in order of preference, provide any supplemental information required for the programs selected, and schedule and participate in any required admissions screenings (admissions exams, auditions, information sessions, and/or interviews). It is EXTREMELY IMPORTANT for you to list the schools/programs on the application in the ORDER OF YOUR CHOICE. You will list the program you want MOST as your first choice, the program you want next as your second choice, and so on. This is the order in which the student will be considered. Note that if you apply for both Choice Programs and Selective Enrollment Programs and Choice Programs, you will rank your selections on two separate lists. Students can receive one offer to the highest-ranked Choice Program and one offer to the highest-ranked Selective Enrollment program where they are qualified and where there are available seats. If they do not qualify for a Choice or Selective Enrollment offer from a program to which they apply, they are guaranteed a seat in the general education program of their neighborhood school.